In almost every garden, there is a need for tough, reliable plants that just get on with the job of growing, without asking anything from us. Plants for screens, to block ugly views, or to make simple hedges – all these should not need us to do work to keep them healthy and growing rapidly. 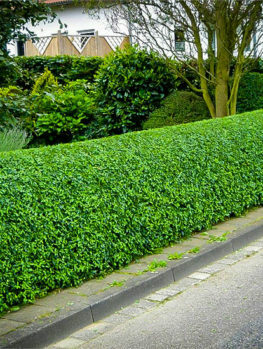 So when we find that Privet Hedges fit this description perfectly, as well as having attractive, glossy, evergreen leaves and pleasant flowers in summer, we need to pay attention. Are these what I am looking for? How can I benefit from growing such an easy tree on my property? There are several different kinds of these trees, but almost all share some common features. They are usually evergreen, and the simple leaves are mostly oval in shape, with a glossy surface that is always attractive. Most flower in summer with clusters of cream or white flowers, often followed by black berries that are favorites with birds. The fact that they look similar has led to confusion, and some privets that probably should not be grown in certain areas, because they can be invasive, are confused with worthwhile and desirable types, which are then not grown, to the great loss of gardeners. 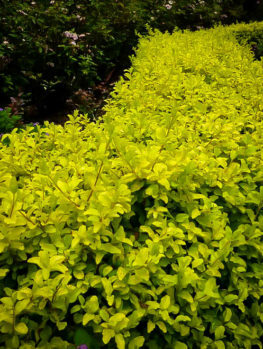 So wherever in your garden you want trouble-free, easy to care for plants that are fast-growing in all kinds of different conditions, then Privet Hedges are often going to be the right choice for you. These trees are very useful ‘work-horses’ around the garden, especially where you need screening or hedges. They are very fast-growing, adaptable to different types of soil and conditions, and they grow well in shade as well as sun, so they are flexible in their needs. Even in very shady locations where many other plants will not grow, they make acceptable hedges and filler plants, so they are ideal for all those difficult spots. They usually never suffer from pests or diseases, they are drought-resistant, and they are easily controlled for size, since they can be cut as hard as necessary, quickly coming back with new, healthy and vigorous growth. As well, these are plants that can cope with the worst urban conditions of dust and pollution, filtering the air as it enters your garden in the process. So if you live in an urban area, and want plants that will give you privacy and screening, without needing anything from you, then these plants have to be a top choice. Perhaps because they are so often used for difficult places, the natural beauty of some, such as the Japanese privet, which forms an attractive medium-sized flowering shrub, can be overlooked. Some deserve more prominence in the garden, where their easy of care makes them ideal if you do not have a lot of time for your garden. Used as foundation plants around your home, or placed at strategic locations around your garden, the smaller kinds in particular are very worthwhile, and under-used plants. To give height to large planters, with smaller plants and flowers beneath them, they can be great choices, and they can be trimmed into attractive, densely-leafed specimens. The glossy foliage and dark color of the leaves is definitely a garden plus, and the ease of their care makes them ideal choices for the busy gardener. 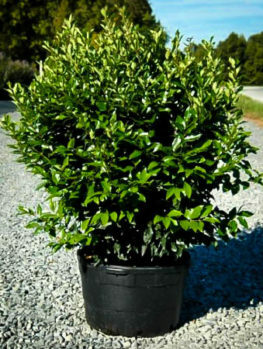 All Privet Hedges belong to the plant group Ligustrum, and are sometimes called ‘Ligustrum’ as a common name. These plants are found in Europe, North Africa and Asia, but most garden plants come from Asian species. Although there are as many as 50 different species, only a few are grown in gardens. They are all evergreen, or at least semi-evergreen, since some lose they leaves in cold areas, but keep them in warmer ones. The leaves are usually smooth, oval in shape, with a surface that is glossy to different degrees. They are usually a rich, dark green in color, which makes them excellent background plants. In some forms, the leaves are twisted slightly, giving them a more interesting form. These are often more worthwhile growing than the normal forms, for that reason. 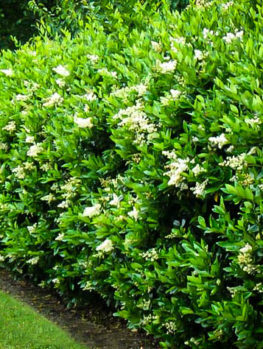 Privet Hedges typically flower in summer, although plants that are regularly trimmed may rarely or never flower. The individual flowers are small, just a fraction of an inch across, and either white or cream. Although they are individually small, they are showy, since they cluster in large numbers in upright flower structures shaped a little like pyramids. The flowers often have a honey scent, although some people don’t find the smell very attractive. They attract a lot of insects, and as the flowers fade they are replaced by clusters of small berries, black or very dark blue, sometimes with a gray powdery surface. These contain a large seed, and very little flesh. They are mildly poisonous, so they should not be eaten by children, but birds love them and swarm over the trees to eat them once they have ripened. The tree usually has more than one trunk, and grows more like a large bush, with several major stems, but it can easily be trained when young to have a single stem, and sometimes they are trained that way and used as street trees. 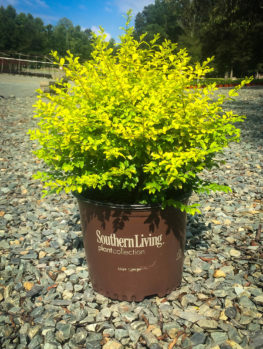 Smaller types can be used as miniature trees in containers with similar simple training and trimming. The bark is smooth, brown-green when young, and gray-brown on older stems. They vary in height between 8 and 15 or 20 feet tall, and the spread, if untrimmed, can be close to or equal to their height. These trees are easy to grow almost anywhere. They will grow well in almost any soil, and tolerate urban conditions well. They have no significant pests or diseases and thrive under harsh conditions, even among the roots of established trees. Despite what its name suggests, the Californian Privet is the hardiest, growing well from zone 5 to zone 8. For warmer areas, the different forms of the Japanese Privet and the Chinese Privet are top choices, as they grow well from zone 7 to zone 10, covering all the warmer parts of the country. You can use privet in your garden everywhere except for the very coldest areas. One of the great things about Privet Hedges is their ability to grow in all light conditions, from full, hot sun to full shade beneath trees. 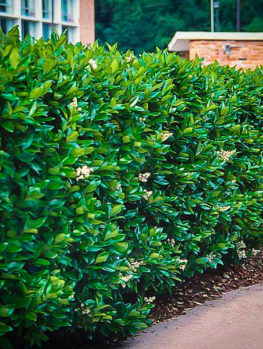 It is true that the growth will be more rapid, vigorous and denser in full sun or light shade, but even in deep shade where nothing else will grow, Privet Hedges will put on a decent showing, surviving and bringing welcome green to the most difficult parts of your garden. If you have areas where you have tried other plants, and they have failed, then try privet – you probably will not be disappointed. Privet Hedges grow well in all kinds of soils, from very sandy ones through to heavy clays. They grow in acidic as well as alkaline soils, and the only soil conditions that may give them problems are areas that are constantly wet. Even there, planting on a mound to give some drainage may be all it takes for them to do well. When planting any plant at all it is always good to add some organic material to the soil, and dig it over, so that the young plant can send it roots out and establish itself. Organic material encourages root development and more rapid growth. Once established – and that will happen quickly – they will grow well with very little attention, and there is no particular need to add additional organic mulches as is often advised for other, more difficult plants. Like all new plants, your young Privet Hedges should be watered regularly. Remember to soak the pot before and during planting. For the first few months watering twice a week is advisable, although once a week will probably be enough unless the soil is very sandy and the weather hot and dry. For the first couple of years a good drink during long dry periods will be appreciated, but mature plants really need no attention. Hedges will be denser and more attractive if watered from time to time during long dry spells. Newly planted trees will benefit from some basic hedge or evergreen tree fertilizer until they have sent out their roots far enough into the surrounding soil to gather the nutrients they need. After that, nothing is really needed, although if you have a hedge that you trim frequently, and especially if your soil is sandy, some fertilizer in spring will be beneficial. There are several different species and types of privet grown in gardens. 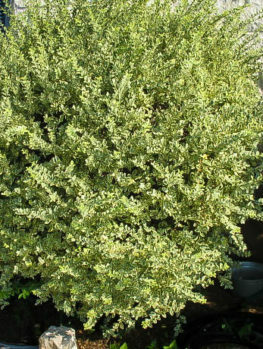 The earliest kinds were forms of the European Privet, Ligustrum vulgare, which is a semi-evergreen species once widely grown in Britain and America. This plant is today rarely grown, as other species are vastly superior, remaining evergreen all winter, which is a big bonus, and having better leaf-color and forms. The plants grown today are all Asian species of privet, and these also come in several different forms, giving us lots of options to work with in different climatic and garden situations. It seems the California Privet was first seen in California, which explains its name, but in fact Ligustrum ovalifolium, to name it scientifically, comes from Japan and South Korea. Its name is also a little strange, because this is in fact one of the hardiest privets, growing well in zones 5 to 8, and not doing so well in very hot areas. In zone 5 it will lose some of its leaves during the colder months, but in warmer areas it is fully evergreen. 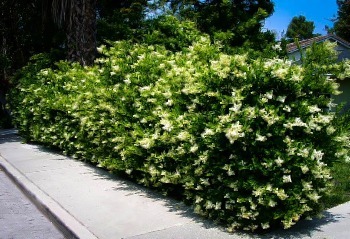 This plant grows very rapidly, 3 to 4 or even 5 feet in a year, so it is ideal for quick hedges and screens. It also grows to a larger size, perhaps 15 feet tall, so it is a good choice on larger properties. One of the problems with privet is not the plant itself, but the places it is grown. It should not be grown in small areas, where it needs constant clipping. Far better to grow it in a larger space, where it can mature into its full beauty. The Chinese Privet bush, Ligustrum sinense, comes, not surprisingly, from China, and can grow to as much as 20 feet tall, so give it room. 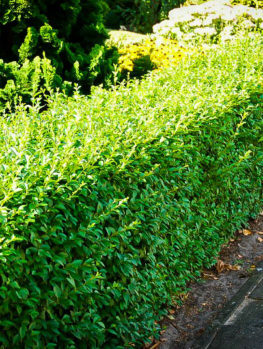 If you trim it regularly, it is a different story, since a 3 or 4-foot hedge is as easy as a 15-foot one. 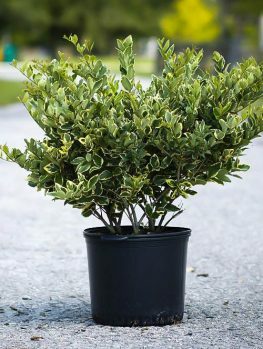 It grows rapidly, responds well to clipping by becoming denser and denser, and makes terrific hedges and screens in all the warm and hot states, since it is hardy from zone 7 to zone 10. The leaves are rarely more than 2 inches long, and can become much smaller on plants that are regularly trimmed, making very dense hedges very easy to grow. It has creamy-white flowers in open clusters in spring and summer, followed by black berries. Because if its vigorous growth and ability to spread, this tree is usually only grown in the variegated form, which is not only attractive, but smaller growing and flowering less often. 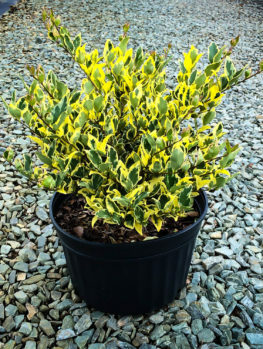 The Variegated Privet, called ‘Variegata’, has leaves with a broad edge of white, making the plant bright and attractive. The new shoots are soft and curve over in an attractive way, adding to the interest of this easy to grow plant. The Japanese privet, Ligustrum japonicum, grows, as its name tells us, in Japan, but also in Korea. 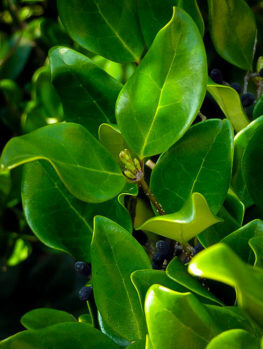 The leaves are a beautiful rich, dark-green color, and they are reliably evergreen, unlike the outdated European privet. The oval leaves are large, up to 3 or 4 inches long, with a smooth, glossy surface. The flowers are the most effective of all the privets, being pure-white, and clustered in dense, cone-shaped bunches up to 8 inches long and wide. They make a very attractive show in spring. Small purple to black berries will develop by fall, and remain on the trees all winter, if the flowers spikes are not removed when they fade. This is the smallest of the privets, reaching only ten or perhaps twelve feet tall in the natural form, and only 6 to 8 feet in most of the varieties. This is a versatile plant, which responds well to trimming, so it easily makes all sort of shapes, from small trees with a single trunk, to cones, pyramids, balls and even spirals. It is also ideal for smaller hedges, between four and ten feet tall. Japanese privet is hardy in all areas from zone 7 and warmer. It thrives in all the warm and hot parts of the country, giving reliable deep-green foliage every day of the year. The Waxleaf Privet, called ‘Texanum’, has obscure origins in Texas, and it is highly regarded for its small size, reaching just 9 feet tall, with very glossy leaves, and profuse flowering with large flower spikes. It is often used for containers, where it can be grown with a trunk, and planted underneath with annual flowers or bulbs to decorate terraces and patios. The Round-Leaf Privet is similar to the previous one, but the leaf is broader and almost circular, as can be seen from the name – ‘Rotundifolium’. The result is an exceptionally dense appearance, with little need for trimming. This variety is called ‘Silver Star’, and it has creamy-yellow margins to the leaves, making a bright, cheerful plant. The simple answer is that in some areas, with some species, privets can be invasive. That doesn’t mean it is always wrong to grow privet. One of the problems is that the different species are hard to tell apart, and when surveys are done, the exact species is often not identified. Two species are probably responsible for most of the environmental problems – the European privet, and the Chinese privet. Both of these are today growing wild in large areas of many countries. 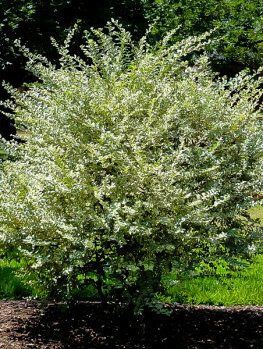 That is why we at the Tree Center only offer the variegated form of Chinese privet, since it flowers less and is less vigorous. European privet is outdated, not very attractive, and we don’t sell it at all. The Japanese privet is widely seen as relatively safe to grow, and the California privet is acceptable as well. Privet spreads by seeds, so the simple answer to making sure your plants can’t spread into local natural areas is to trim them once the flowers fade. If no seeds are produced, then plants can’t become invasive. It’s simple. Since an annual trim is also good for the appearance of your bushes, you gain both ways. Smaller types like Japanese privet never get so big they are hard to trim, so that simple, once-a-year job is the perfect solution.